Any size yard can be turned into an oasis. 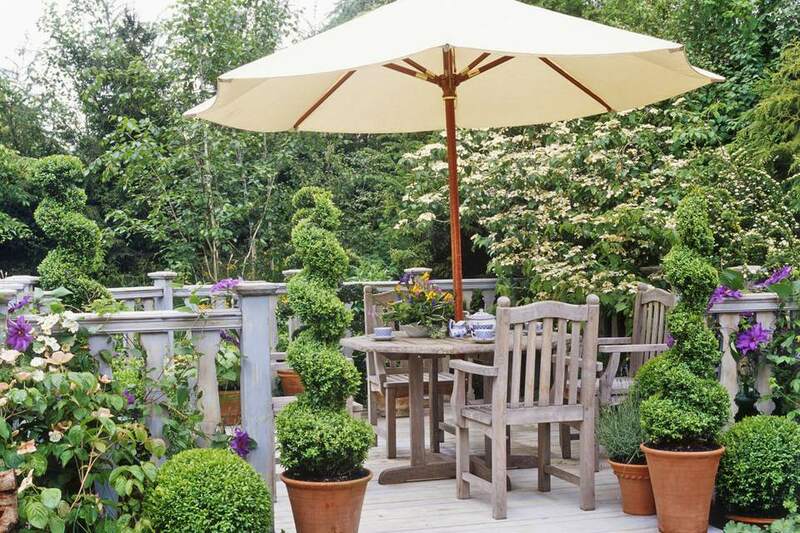 Dress up your outdoor entertaining space with potted evergreen topiary. They somehow manage to be both formal and festive at the same time. Since they are evergreen, they will look good at any time of the year. You can even dress them up for the holidays and light them up for evening entertaining. An island garden in the lawn makes a great focal point. Dress it up even more with bold, eye-catching ornaments or large containers. Since the island is viewed from all sides, you can plant tall, full plants in the center, to inspire a feeling of abundance. No matter what amount of space you have to garden in, it will always feel larger if there’s some distance between you and the garden. A thin strip of lawn provides enough separation to create a view from your living area. Frame the view with small trees and shrubs and then paint the area with soft textures and colors. Now when you walk out onto your deck, you can step right into the composition. Even the smallest garden will make a big difference. Bright colored furniture and ornaments can set a tone for your garden, even when your plants are not in flower. This is one time that having a small garden is a real advantage because you can get a lot of impact from only a few well-chosen pieces. They can be moved about the garden or they can become a part of the garden. A typical small, square, suburban backyard will expand in size with the addition of curving paths that partially obscure the view around them. Avid gardeners can wind their way throughout the yard, but even a single crescent will create intrigue. Keep the look cohesive by repeating color intermittently throughout the planting. The use of cool blue plants at the end of the border further creates a sense of distance. Create your own Versailles with the help of clipped hedges and evergreen parterres with geometrical details. One good pruning in the spring and a little touch-up mid-season is all it takes to make your home your castle. You can dress is up or down with seasonal pots of colorful flowers and furniture to suit your taste. Even if you have no yard at all, you can still make room for a smaller garden. Whether you are trying to create a sense of privacy or encourage neighbors to stop by and chat, a simple table and chairs encircled with large containers turns this open space into a joyful bistro-like gathering spot. If the only space you have to garden in is a tiny courtyard, look up, rather than out. By training vines along the wall of the house and the adjoining fence, an intimate, yet opulent, dining space is created. The small pond in the foreground adds a cottage garden feel, with moss growing on the stone and wide clumps of flowering plants. If your small yard borders a wooded area, borrow the view and create some intrigue about what's on the other side. Nothing works better than a see-through fence with a gate. Let the garden path lead right up to the gate and then make it all the more alluring by placing a focal plant or container on the other side of the gate. It doesn’t matter if you never venture into the woods, you will feel like the expanse is all part of your yard. The only thing more amazing than how much fruit you can get from one espaliered tree is how attractive and tempting it looks spread out on a patio fence or wall. While it looks very complicated and exacting, all it really takes to grow a trellised fruit tree is some hooks, wire, and patience. In a few years time, you'll have an orchard within arms reach. Apples, pears, peaches, plums, even persimmons can all be trained to grow this way. Ladders are often used to hold things indoors and they are just as functional and attractive outside. Whether you choose a rustic ladder with well-worn character or paint it a bright, cheerful color, ladders are a great way to add a curtain of greenery to a wall. Just because a garden space is small doesn't mean it can't be grand. Rather than a standard deck with an umbrella table and grill, this space incorporates a water garden filled with lush, low-maintenance plants, such as hosta, ornamental grasses, waterlilies, and a flowering clematis vine, for color. The sound of trickling water can be enjoyed in over-sized, comfy chairs that offer a respite from the afternoon sun with an over-sized arbor and bamboo shades. If you are lucky enough to have a shade tree in your yard, put it to good use and create a seating area nearby. The spiraling pattern of the borders makes the space seem larger. Raised beds nearby provide extra seating or table space and make the garden easier to maintain. A small garden can be magical at night, with the addition of hanging lights. You can string the trees with fairy lights or create your own, personalized lanterns. Rope attached to the lids of canning jars filled with candles or LED lights does the trick here. Make it even more magical by including some fragrant flowers, to take over as the flowers take a backseat in the dark. A welcoming entryway really gives a house character. Vines and shrubs are also a great option, but when your entryway is entirely paved, containers are the way to go. Don’t go small on impact. Either choose a large container and fill it to overflowing with plants or use smaller pots and lots of them. These geraniums and impatiens make a joyful greeting without getting in the way of anyone going up the steps. Annual plants are great choices because they will remain in bloom all season. Just about anything that can be grown in the ground can be grown in a container. If you spend the bulk of your outdoor time on your deck or patio, bring some appetizing plants right near your table. Dwarf citrus trees are perfect candidates for patio containers. They don’t need an overly large pot and remain small enough to move about if you need to. Although citrus trees cannot withstand freezing winters, they can be brought indoors to enjoy as houseplants, until you and your tree are ready to revel in summer sunshine again. Sometimes the sunniest spot in the yard is out front. Set your house apart with some unexpected curb appeal. Larger shrubs keep the proportion of a more traditional foundation planting and also reduce the amount of maintenance you will have to do. That is something important to keep in mind if you live on a busy road. Make sure you can still see out your windows ​but have fun tucking in small surprises of color and texture or scent. Some wildlife is welcome in the garden and birds would have to be at the top of the list. A bird feeder is a charming garden ornament all year, especially in winter, when it attracts a flurry of hungry birds. They'll add color, sound, and movement when your yard needs it most. Herbs are among the easiest edible plants to grow and they require very little space. Not only are potted herbs space savers, they can be kept handy for spicing up your dishes at the last minute. You could even keep a pot on your table, for the freshest flavor possible. Dress up the top of your deck's railings with flower boxes contoured to fit snuggly over the rail. They add color to the deck, without taking up floor space. They even give a little extra privacy. Creating a container garden is the easiest way to add plants and color to a small space. Mix up the sizes of the containers and also the plants, for a true garden feel. Maintaining a color palette within either the plants or the containers themselves will tie the space together and make it feel like a real garden. Love the look of a verdant garden but not the maintenance. If you don’t have the interest or the time to devote to a flowering garden, succulent plants are the answer for you. These fleshy-leaved plants virtually never need to be watered and there’s no need to prune or deadhead, either. Many will happily spread and flow into one another, creating a tapestry carpet that smothers out weeds. Even if they don’t have spectacular flowers, the leaves can be colorful enough on their own. And many survive for years on neglect. Feel free to express yourself in other ways and add a personal touch to your succulent garden. Add weight to a small garden space by defining it with walls. Walking through hedges announces that a garden has begun. You can make it your own private sanctuary. Evergreen hedges also provide the perfect backdrop for smaller plants and accent colorful flowers and foliage. There’s something about being in a gazebo that makes you feel like you are truly part of the garden. Garden benches are often mere decoration, but a gazebo invites you to bring a pitcher of lemonade, a snack, and a few friends and sit for a moment to savor what you’ve accomplished. Put up a gazebo, whether it is rustic or ornate, and you will find yourself dressing it up with plants and comfy cushions and making up excuses to visit. There is no better place to inspire some summer reading or have a glass of wine at the end of the day than in your gazebo. Every yard and garden needs a tree to lift the eyes. However, even dwarf trees can grow quite large and take over the space. Tree roots travel much wider than the branches of the tree and they can push through lawns and even your home’s foundation. The perfect solution is to add a potted tree or two to your yard. You’ll need a fairly large pot, but the roots won’t wander any further than their container, while you get to enjoy the breathing space. There are no rules in the garden. It’s the perfect place to put your own style on ​show and a great way to do that is to display the things you love to collect. Whether it is wooden wheelbarrows, bright glass bottles, seashells, or garden gnomes, the things that inspire you to make a small space garden even more intimate. You don’t need a “lower 40” to grow your own food. Actually, starting small is often the key to enjoying vegetable gardening, which can be a lot of work. You’ll be surprised how much you can grow in a few square feet of soil. Tomatoes, peppers, and beans can even be grown in containers. Limited space should not limit your enjoyment of a homegrown meal. Rather than putting your entertaining area right outside your door, make it a retreat in a shady corner of your yard. Fill it with soft, sumptuous plants, add a little privacy screening and want to live out there day and night. Add some drama to a small space by including one large, animated plant, like this arching agave. It almost doesn’t matter what else is planted nearby, since all eyes will be on your diva. Place it along a path, where there will be no chance of missing it. It will anchor your whole garden and make any flaws seem to disappear. It’s an old trick, but it works just as well now as it did centuries ago. On large estates, elaborate small buildings were built on the fringe of the garden, just for whimsy. They were called follies and were meant for visual appeal, not for any practical use. However, they are hard to miss and it is almost a guarantee that any visitor to your garden will make the walk out there to get a closer look. Garden gates are not meant to keep people out. Give people an idea of what’s to come, in front of your gate, and then leave the gate a little ajar, to let them know they are welcome to come through. How could you resist wandering down that path? The fact that the gate is dangling open causes you to create a story of what’s going on down there, in your mind. Shrubs are great plants for adding multi-season interest and minimal maintenance. When the sun hits flowering shrubs, they can literally light up your yard. You can find shrubs that flower at just about any time during the growing season in colors for every taste. They are the quickest way to add impact to a small garden. Pathways always make a garden more interesting and inspiring. They make your eye pause as it scans down a border and, with a few carefully placed bends, trick you into pausing and having a good look around. Paths can be left bare, planted over with grass, or they can be made of some type of stone or gravel. Brick paths are especially enchanting because the color is such a natural complement for most plants and the patterns they create make even the smallest garden seem larger. The Japanese Tea practice can be very exacting, but the sense of peace created in a tea garden can be created in any size space, even if you break some of the rules. Most are kept very simple, with a small wooden building or gazebo and a handful of subtle plants. If you are looking for a quiet, contemplative idea for your small garden, a tea garden could hit the spot. Dress up a trellis or pergola across a path in your yard with a dramatic flowering vine, like wisteria or climbing hydrangea, and you've essentially doubled your garden space. You could even drape it with grapes or ornamental gourds, for color and function. Having your guests enter your garden through a gate is a guaranteed way to create impact. This works especially well if your front yard is tame and inconspicuous and beyond the gate is much more spirited. Having a defined and inspired entrance to your garden can change the feel of the space, the way going from black and white to color did for the Land of Oz. Water is such a welcome element in any yard. It always has a cooling effect and if you add a small fountain, the sound is very soothing. Water gardens do not have to be large. You can easily grow waterlilies in a few square feet of water. Every bit as important as having flowering shrubs in the yard is planting for fall color. Your space will explode in size when the light hits the changing leaves of plants like Fothergilla, spicebush (Lindera benzoin), oakleaf hydrangea (Hydrangea quercifolia), and highbush blueberries. Lawns are not the only way to interpret having a yard. If pushing around a lawnmower is not for you, skip the grass and plant your garden right up to your living area. If you miss walking on something green, there are plenty of plants that will grow between the cracks of your stepping stones. Most people feel pretty comfortable decorating their homes, so it’s odd how intimidating accessorizing a garden can be. For beginning inspiration, just think about the colors and texture you like. You’ve probably already done that when choosing your plants. Extend it into the ornaments you pick. The idea is that if you like bold, hot colors, glazed pots in similar colors will brighten things even more. Likewise, if you’re drawn to more subdued colors, like these irises, incorporate structures in similar hues. Before you know it, you’ve designed a garden. Create some eye-level interest in your garden with tall containers. You can find all sorts of options in a salvage store, like chimney pipes and concrete columns. You can be as artistic or whimsical as you like. The containers and stands may steal the show from your plants, but you can also swap the plants in and out for a whole new feel. If space is at a premium, you will want to make sure everything in your garden serves multiple functions. Just as you would create layers of plants in a border, you can underplant container grown trees and other large plants with smaller, showier plants. Living walls of plants are stunning, but they are also complicated to put up and tricky to maintain. Inspire the same effect by attaching potted plants all along an outside wall. They'll still be alive with greenery and you can move them around or swap them out as you like. There’s a bounty of plant stands available and they make a great alternative for stacking pots and growing plants vertically. If the idea of a living wall is too daunting for you, look for a multiple pot stand that sits relatively flat against the wall. You’ll have the option of switching plants in and out with the season and the same effect as a living wall. Take a tip from interior designers and use a mirror to expand the space in your garden. Position it to reflect your garden back at you, but be careful not to place it in direct sunlight. Mirrors work best in partially shaded gardens, where they can bring in more light and where they will glow in the evening light. A narrow side yard is often forgotten space. Rather than using it to stash the garbage cans and hose, let it serve as a small garden, making a nice transition from the busy, public front yard into the family area of the backyard. Choose plants that won’t grow so large you have to squeeze between them and keep your neighbors in mind. Make sure it looks nice from the other side, too. Utilitarian buildings and structures are useful in any size year, but in a small space, they can be a huge eyesore. Treat yours as an element in your garden and have some fun dressing them up. A sheet of lattice on a wall makes the perfect surface to grow a flowering vine like a climbing rose, a clematis, or a quick growing annual vine. Your storage shed is now a garden cottage. Window boxes instantly dress up any home. You even gain a better view from inside the house. Just by changing the plants, you can have seasonal accents all year. Plants that tumble over walls onto paving and paths soften hard edges and blur the line between living space and garden. This gentle flow gives the space the illusion of expanding. When you use ebullient plants that are a bit unruly to begin with, you create a bit of abandon and wildness. A covered patio can truly become an outdoor room, with the addition of some indispensable comforts, like a ceiling fan, shelves and, of course, overstuffed cushions.